What is a Notary Form? A notary form is typically some type of form that needs to be notarized. In some instances, the notary will also verbally question the signer. For example, if the document requires an oath, the notary may ask, "Do you swear under the penalties of perjury, that the information contained in the document is the truth, so help you God?" All notary forms must be completed, signed, and stamped by a notary public in order for a signature to be considered authenticated. Complete and submit a notary application. Pay the state’s application fee. Get training from an approved education vendor (if applicable, check with your Secretary of State's Notary Division or Division of Corporations, UCC and Commissions). Pass a state-administered exam (if applicable, notaries in 18 states and the District of Columbia are required to take a course or pass an exam or both). Complete fingerprinting and background check (if applicable, check with your Secretary of State's office). Receive your notarial certificate from the state. Note: Notaries may have continuing obligations to their state, such as letting the state know about any change or name or address change. The application that you submit to become a notary may become a public record. 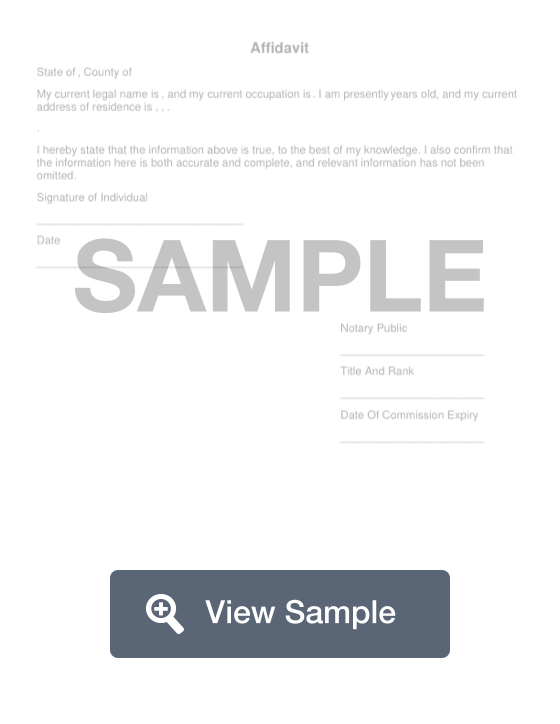 Create a free Notary Form in minutes with our professional document builder. What Does it NOT Mean to Have a Document Notarized? Having a document notarized does not make the document more legal nor does it validate the document or verify that the statements in the document are true. It simply means that a notary has properly identified the signer of the document and verified their willingness to sign and mental capacity. A notary form may be filled out for an individual acting in his own right, for a corporation, for a partnership, for an individual acting as principal by an attorney in fact, or by any public officer, trustee, or personal representative. How to Get a Document Notarized? Each state has its own regulations and guidelines regarding their notaries’ duties and the notarization processes. Generally, however, in order to have a document notarized, you must go to a notary near you, have your identity verified, sign the document in the notary’s presence, and pay a fee if applicable. Your Signature - You must appear in person to sign the document in the presence of the notary. The document must not be signed beforehand. The Fee - Some banks and financial institutions allow account holders to have documents notarized for free. Otherwise, you may be required to pay a small fee, typically less than $20. Some states limit how much a notary can charge for an individual notarization (ex: in California and Florida you can only charge $10, Pennsylvania notaries can only charge $5, in states like Maine notaries can charge any fee they feel appropriate). Once a notary has verified your identity and accepted your fee, they will stamp and sign your document with their notary seal. A notary seal generally indicates when a notary's commission expires. If the notary stamp does not have an expiration date, the notary can print "My Commission Expires on" and the date under or near the signature. Where to Get a Document Notarized? There are many notary directories on the internet. Use your location and the word "notary" to find a place to get a document notarized near you. Note: you cannot get a document notarized at a post office. In addition, there are notaries who are available to travel to your home or office to notarize documents. These "mobile notaries" often include a travel charge along with their fee. Finally, you may be able to have a document notarized online, however, you should first find out if this will be acceptable for your purpose. Some transactions may require that you appear physically in the presence of the notary to have a related document notarized.